This story was updated at 6:20 p.m. ET. 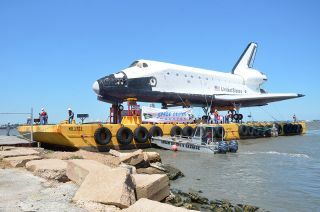 A full-scale space shuttle replica came into dock on Friday (June 1), but rather than pull into an orbiting space station, it arrived at port in a Texas lake near NASA's Houston space center. The high-fidelity space shuttle mockup, which was known as "Explorer" for the 18 years it was at NASA's Kennedy Space Center Visitor Complex in Florida, sailed into Houston's Clear Lake to a dock opposite the Johnson Space Center (JSC), where it will be offloaded for display. "Though this is not a space flown orbiter," JSC director Michael Coats said, "it is the only one we know that is seaworthy." The replica left the Florida spaceport on May 24 atop an open-air, flat-bed barge and made its way around the Florida peninsula and through the Gulf of Mexico. It entered Galveston Bay on Thursday (May 31). A welcome ceremony launched the celebration on Friday, with the performance of the national anthem and a flyover by NASA's T-38 astronaut training jets. Houston Mayor Annise Parker joined other local mayors delivering remarks before Max Q, the "All-Astronaut Band" took the stage. "We don't need an artifact to remind us of the space program, we've lived the space program," Mayor Parker said. "Our neighbors are the space program. Our history is the space program and we're just glad this was a successful relocation of this mockup of the space shuttle so we can get it installed at Space Center Houston. The Friday evening celebration was scheduled to end at 10 p.m. EDT (0200 GMT June 2) with a fireworks display over Clear Lake. On Saturday, cranes will off-load the 122.7 foot long by 54 foot tall (37.4 by 16.5 meter) mockup off the barge and onto a wheeled transporter. The 130,000 pound (60,000 kilogram) replica is the largest item to come on shore using the Johnson Space Center dock since the three stages of a Saturn V moon rocket arrived in 1977 for display. The public "Shuttlebration" will pick up at 6 a.m. EDT (1000 GMT) Sunday for the replica's three-hour trip to Space Center Houston. The slow roll will give workers time to clear traffic signals, trees and other obstacles along NASA Parkway (also known as NASA Road 1). NASA's next generation exploration rovers will join the procession, symbolizing the future of the space shuttle's human spaceflight legacy. "We want them to see our history, but we want to be inspired to go out and make history with us," Coats told collectSPACE.com. Once the space shuttle mockup is in place outside Space Center Houston, the visitor center will open its parking lot for a free, family-friendly display of space-related exhibits and activities. Guests will also have the opportunity to view the space shuttle mockup at its new home. The replica will eventually become the star attraction of an educational exhibition themed around the retired space shuttle program. Designed for outdoor display, the mockup is fully-detailed inside and out. Once an access ramp is erected later this year, Space Center Houston visitors will be able to walk through the orbiter to see its crew compartment and inside its payload bay. Built by Melbourne, Fla.-based aerospace replica manufacturer Guard-Lee, Inc., the mockup is considered to be the highest fidelity model of the shuttle ever created. Built using schematics, blueprints and archived documents lent by NASA and its shuttle contractors, some of the mockup's core parts, including the tires used on its landing gear, are authentic to the shuttle program. "I think it's realistic enough for the kids to understand what we were doing when we were flying the space shuttles, which is the important thing to me," Coats said. "I want to inspire young people."